Uganda is already experiencing the impacts of climate variability and associated economic losses. A drought in 2008 caused losses of approximately 3% of the value of all food and cash crops that year. Two years later, the country lost 16% of the total annual value of these crops as a result of extreme weather. 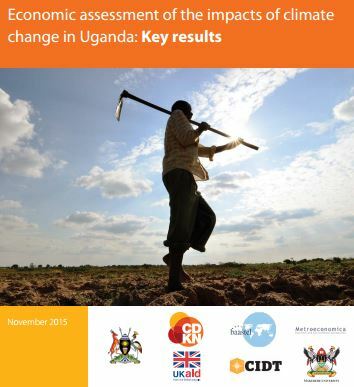 This study*, an output from the Economic assessment of the impacts of climate change in Uganda commissioned by the Government of Uganda, aims to provide the Government with economic evidence on the current and future costs associated with climate variability and predicted climate change, and the necessary adaptation measures for different sectors at both national and local scales. This evidence is intended to help policy-makers mainstream climate change and resilience into national and sectoral policies and develop the case for investing in adaptation. The study team engaged with around 200 stakeholders from the Government of Uganda and around 300 people from districts and civil society through face-to-face meetings, workshops, interviews and field missions. Evidence from the study has already informed Uganda’s Intended Nationally Determined Contribution (INDC) to the 21st Conference of Parties (COP 21) to the United Nations Framework Convention on Climate Change (UNFCCC) in Paris, France, in late 2015. *download the report via the link provided under further resources. Development prospects will only be reached if the impacts of climate change on Uganda are mitigated. The impacts of climate change are expected to be felt across all the sectors and local areas studied, to varying degrees. The cost of adaptation is high: estimated at around US$406 m over the next five years (2015–2020). On an annual basis, this amounts to about 5% of net official development assistance received and 3.2% of total government revenues (excluding grants). The cost of inaction is 20 times greater than the cost of adaptation: inaction is estimated at between US$3.1 bn and 5.9 bn per year by 2025, which is more than 20 times the proposed adaptation budget. The economic case for adaptation is clear: many of the adaptation measures proposed in the study are ‘no regrets’ investments, in that they are valid even in the absence of climate change. Considering the co-benefits strengthens the case for adaptation further, for example improved livelihoods, health and access to energy; these represent strong investments in the development of Uganda’s future. the Mpanga river catchment: water and hydropower y Kabale and Tororo districts: malaria prevalence. A summary of the current vulnerabilities and adaptation priorities for each sector, and the results of the local case studies are detailed in the report (link to download provided under further resources). The study assessed the impacts of climate change under two scenarios, both derived from the work of the Intergovernmental Panel on Climate Change (IPCC). The first scenario represents medium-to-low concentrations of greenhouse gas emissions and associated levels of warming (known as the Representative Concentration Pathway or RCP 4.5, see Figure 1). While this is not the lowest scenario produced by the IPCC, this is a more ambitious trajectory than suggested by the collective pledges submitted by governments to the UNFCCC in 2015. The second scenario assessed by the study looks at a high emissions scenario (known as RCP 8.5, see Figure 1). For more about the science of climate change impacts on natural and human systems across Africa under these different scenarios, please see CDKN’s guide The IPCC’s Fifth Assessment Report: What’s in it for Africa? This paper is based on a study commissioned by the Climate and Development Knowledge Network (CDKN) at the request of the Government of Uganda. It was funded jointly by CDKN and the UK Department for International Development (DFID), Uganda office. The work was coordinated locally and owned by the Climate Change Department (CCD) of the Ministry of Water and Environment. The study team was led by Le Groupe-conseil Baastel sprl (Baastel) and included a team of experts from Makerere University (Uganda), Metroeconomica (UK) and the University of Wolverhampton Centre for International Development and Training (CIDT) (UK). The study was highly participatory, and benefitted from valuable contributions from many people and organisations inside and outside of Government, from Uganda but also from Rwanda, Kenya and Tanzania. The Baastel consortium’s full report ‘Economic Assessment of the Impacts of Climate Change in Uganda’ is available in full on www.cdkn.org. Its main authors were Anil Markandya (Metroeconomica), Courtenay Cabot-Venton (Baastel) and Olivier Beucher (Baastel).